JCECEB VtoDECE → It is the Jharkhand Vocational / ITI to Diploma Entrance Competitive Examination (VtoDECE). 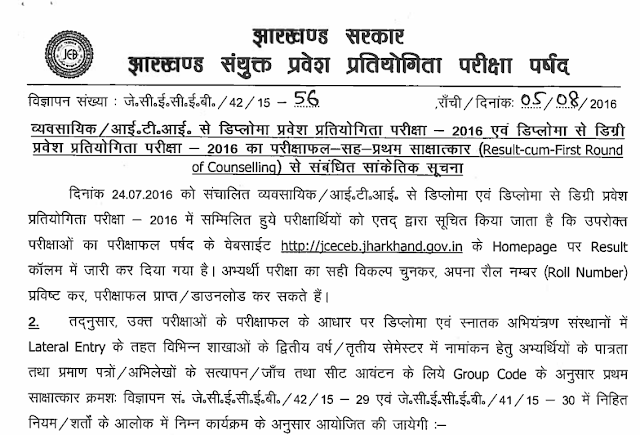 For admission in the third semester in technical institutes of the state, the Jharkhand VtoDECE 2016 is being conducted by the Jharkhand Combined Entrance Competitive Examination Board. Such candidates who have qualified Intermediate Vocational Course Examination, or ITI in listed courses, can fill the JCECEB application form for VtoDECE 2016 at jharkhand.gov.in. 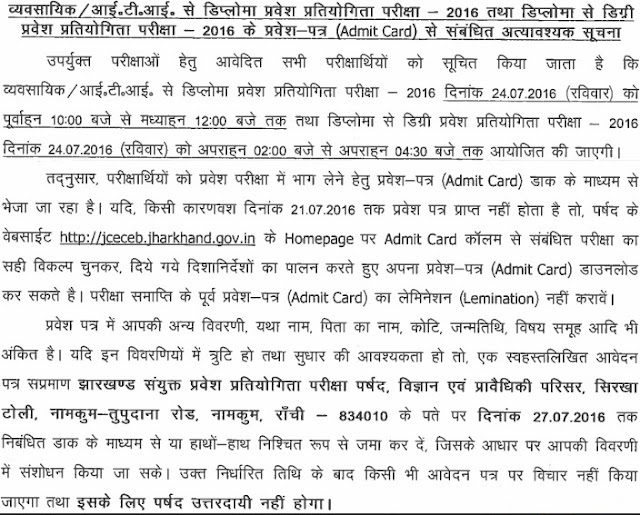 Admit Card was released on the official website of JCECEB. The date of Exam is 24 Jul 2016. Candidates download their admit cards from the official link provided below. • Passed Matriculation / 10th along with any one of the following 2 year’s ITI trades – Fitter, Turner, Mechanist, Mech. Motor Vehicle, Mechanist Grinder, Mech. Refrigeration & Air Conditioning, Draftsman Mechanical, Instrument Mechanic, Electrical, Electrician, Wireman, Electroplater, Surveyor, Draftsman Civil, Mech. General Electronics, Mech. Radio & T.V., Mech. Consumer Electronics, Mechanic Industrial Electronics, Electronics Mech., Mech. Computer Hardware, I.T. & E.S.M. 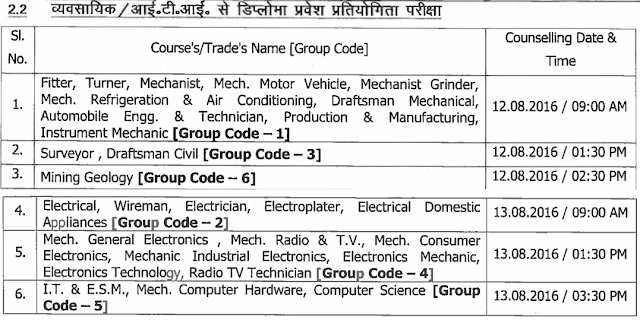 Respective Branches of Vocational / I.T.I. Electrical, Wireman, Electrician, Electroplater, Electrical Domestic Appliances  Electrical Engineering / E.E.E. • Syllabus of the exam → Science & Mathematics of 10th standard.